Gram-negative bacteria actively secrete outer membrane vesicles, spherical nano-meter-sized proteolipids enriched with outer membrane proteins, to the surroundings. Outer membrane vesicles have gained wide interests as non-living complex vaccines or delivery vehicles. However, no study has used outer membrane vesicles in treating cancer thus far. Here we investigate the potential of bacterial outer membrane vesicles as therapeutic agents to treat cancer via immunotherapy. 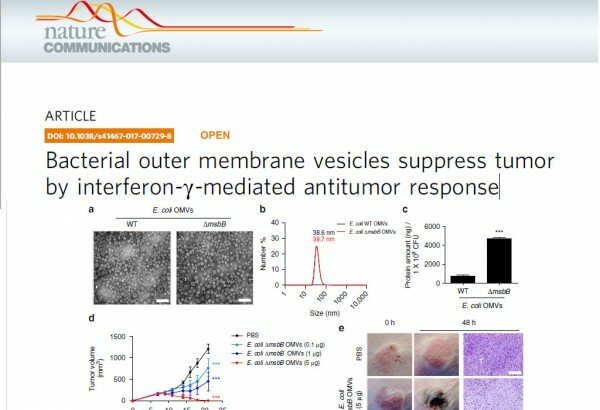 Our results show remarkable capability of bacterial outer membrane vesicles to effectively induce long-term antitumor immune responses that can fully eradicate established tumors without notable adverse effects. Moreover, systematically administered bacterial outer membrane vesicles specifically target and accumulate in the tumor tissue, and subsequently induce the production of antitumor cytokines CXCL10 and interferon-γ. This antitumor effect is interferon-γ dependent, as interferon-γ-deficient mice could not induce such outer membrane vesicle-mediated immune response. Together, our results herein demonstrate the potential of bacterial outer membrane vesicles as effective immunotherapeutic agent that can treat various cancers without apparent adverse effects. 이전글Mitochondrial chaperone HSP-60 regulates anti-bacterial immunity via p38 MAP kinase signaling.